There is value in stepping back from our work and looking at it from different perspectives. In doing so, we will learn more about ourselves and our path and patterns. Our images reveal not only what we see, places we’ve been and what peaks our interest, but also how we see them and, if we’re lucky, how we feel about them. We can observe images and easily recognize and remember our disconnectedness from a subject. We wish for better. Then, there are the images that bring us back to a moment and evoke a palpable sense of engagement and attention. Those are the images and subjects that speak to us and our audience below the surface. Those are the ones we allow to be imperfectly perfect. MAN ON STREET ACROSS FROM CAPITOL BUILDING This is an image that haunts me. I cannot “un-see” it, and I cannot forget that it was taken immediately after visiting one of the most beautiful buildings I have visited. 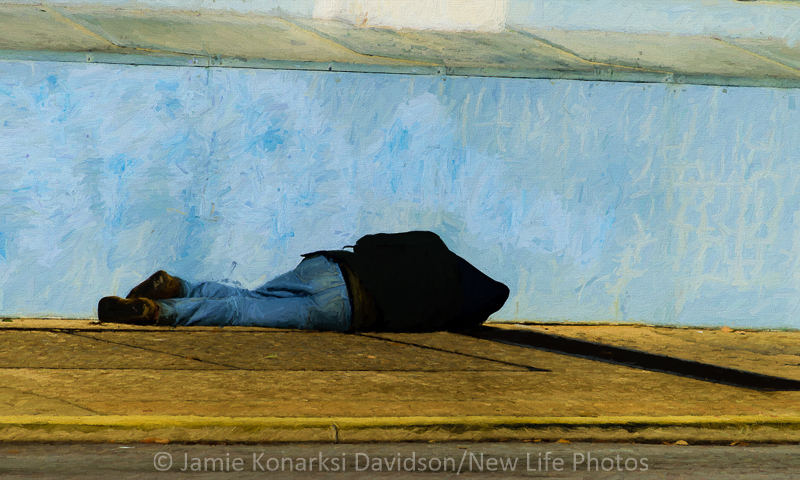 This man was on the sidewalk across the street. I wrestled with myself about taking the picture and almost didn’t. In that moment I learned something about myself. I don’t ever want to take another image like this unless I can do more than capture a broken moment in someone’s life. It was only one image, but one I will never forget. We all know and have seen images that have been worked to perfection on a technical level and yet are void of impact and emotion. (We’ve probably taken them, too.) While we can appreciate the efforts of technical mastery, these are the same images that lose our interest quickly and are easily forgotten. Then, there are images that yank us in, draw our attention and keep us there – not because of technical perfection but because they speak to us on a deeper and more connected emotional or spiritual level. They touch our souls. 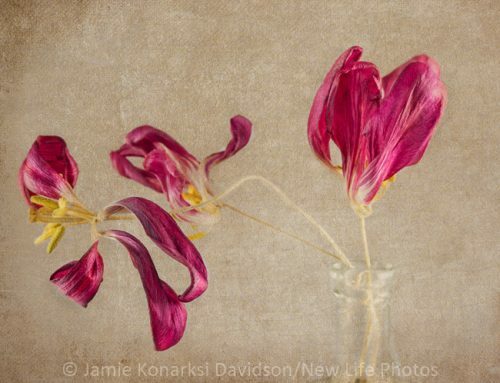 We as the photographer/artist (and the viewer/audience) connect with what we have chosen to put in the frame and how we have chosen to finish the image in our refinement process. If you want to learn more about your work, how you see the world, or patterns within your vision, take a closer look. 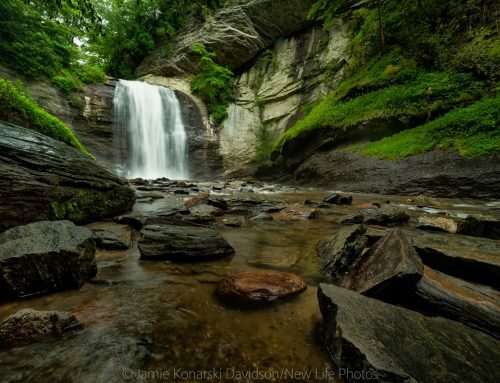 How do you photograph places you spend time in? 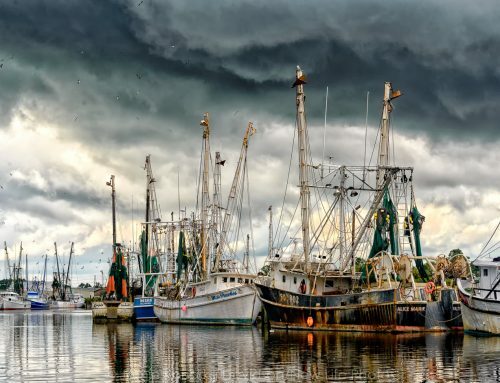 Are you a “big picture” person, and your images reflect that? Do they speak to the essence of places that touch your heart or do they simply document what you’ve seen and say “I was here”? Do you tend to see and photograph the smaller stories, intimate landscapes, moments that might have been missed by others, or even by you, if you had hurried by? Or do you find yourself going in deeper still to the point that “context” and place are not part of the stories you tell? 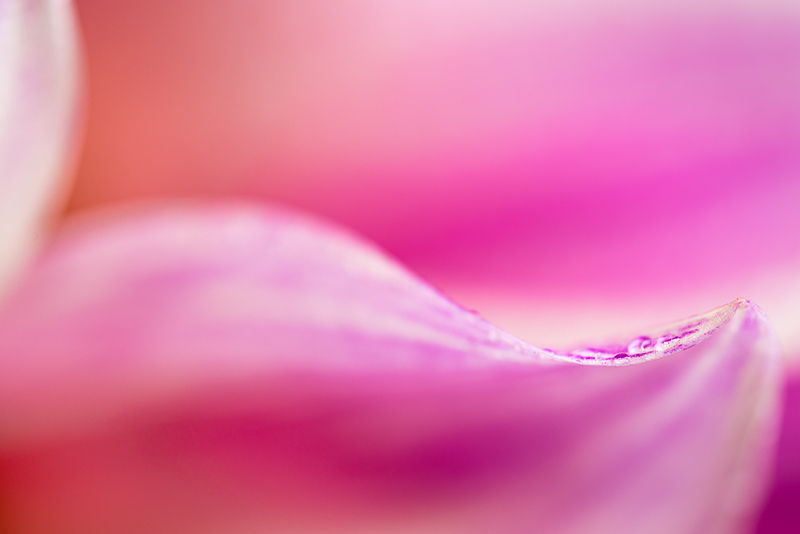 FLOWING IN THE PETALS OF A DAHLIA – This image was created using the Tamron 90mm macro lens with Nikon 6T supplemental close-up lens. Take a good, long look. See what you learn about yourself by looking at the images. Can you remember what made you stop? What held your attention then? What holds your attention now? Are they the same? Do you see something more or different? Do your images reflect those moments? Do they bring you back in time? 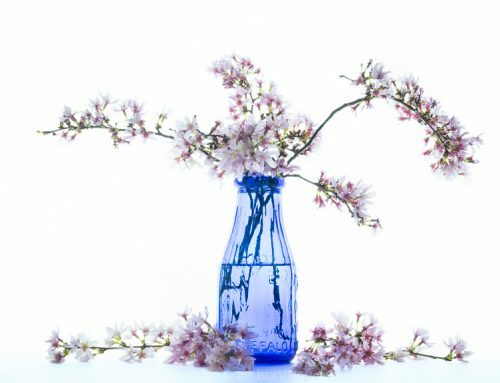 Challenge yourself to gather a cohesive collection (or more) from your archives. See what you discover. 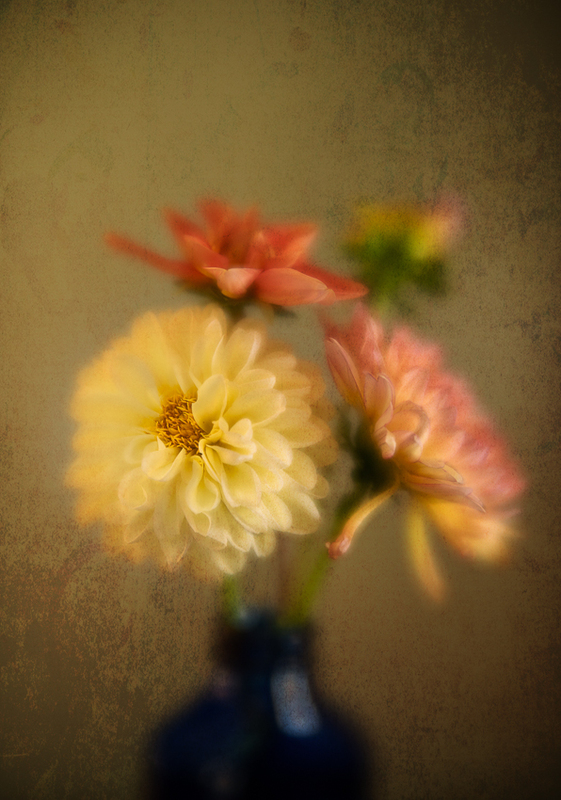 DAHLIA STILL LIFE – This image was created with the Lensbaby Velvet 85 in my living room and a texture from Topaz Texture Effects. Over the course of the last six months I have heard in three different ways the call to “see in six.” First, from a fellow photographer who submitted to the Seeing in Sixes project. Then, two other photographer friends shared with me the first two volumes of the Seeing in Sixes books. Finally, a challenge came through an in-depth mentoring course by David DuChemin (The Compelling Frame). I got the message, and I did it. 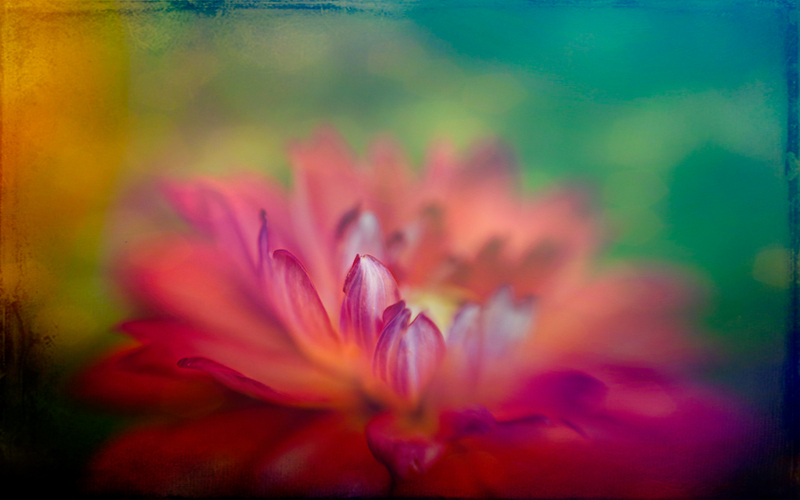 It has been an enlightening endeavor, even with the constraints I gave myself with the dahlias. It has inspired me to look at and gather more collections that reflect a part of who I am, how I see and what I love. 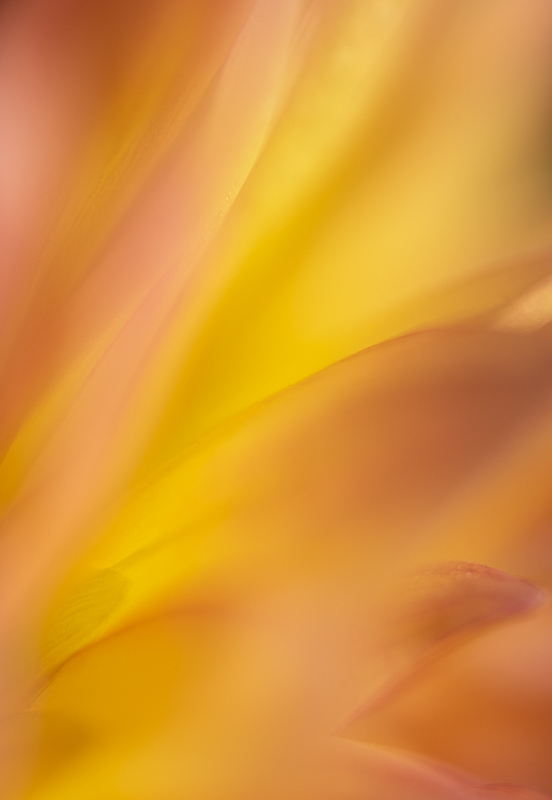 DAHLIA PETALS IN ABSTRACTION – This image was created using the Tamron 90mm lens and adding the Nikon 6T supplemental close-up lens. 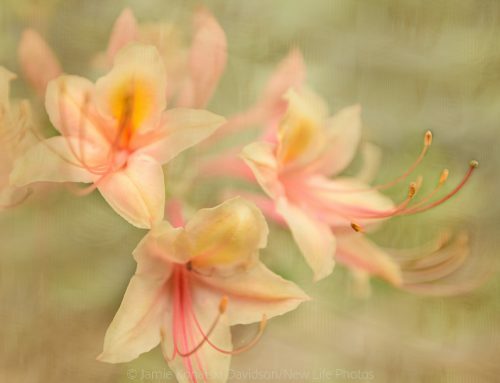 For my set of six, I chose images I had taken within a six-week timeframe. My dominant subject during that time was (and still is) my “dates with dahlias.” Along with the constraints of time and subject, my third requirement was that each frame needed to reflect something more about me and my connection to the subject. Each one needed to be personal and unique to how I see and feel about dahlias. There were no other “rules.” The six images shared here are “me.” Each one speaks to more than “This is a dahlia.” I recognized and accepted long ago that I am not a documenter. I am an interpreter. My best work reflects not only what is “real” and what I see, but rather what I see and how it makes me feel. 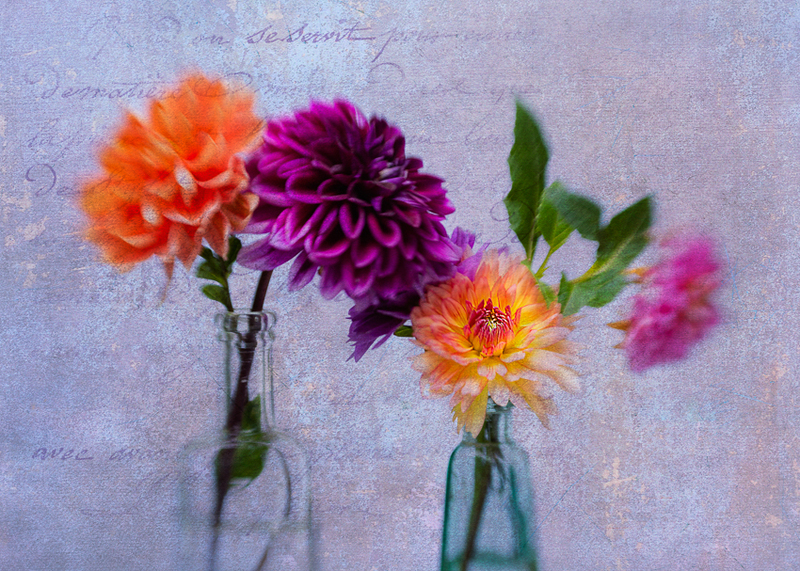 DAHLIA IN BOTTLES – This image was created using the Lensbaby Edge 80 optic and a French Kiss texture called Purple Prose. Whether consciously or not, we notice things that touch us below the surface, that tug on a part of our heart and awaken a sense of wonder and more. What those things might be are different for everyone. They also change along the way as we experience life, learn new things, meet new people and grow as individuals. Take a look … pick a number. I challenge you. What does your set look like? What does it reveal about you – as a person and as a visual artist? What does that collection say about what touches your heart? Give it a try and see where your “look back” takes you. Discover what your work tells you about yourself. And keep looking. Those touchpoints have and will continue to change and grow as you do. It will reveal insight and be reflected in ways that may surprise you. 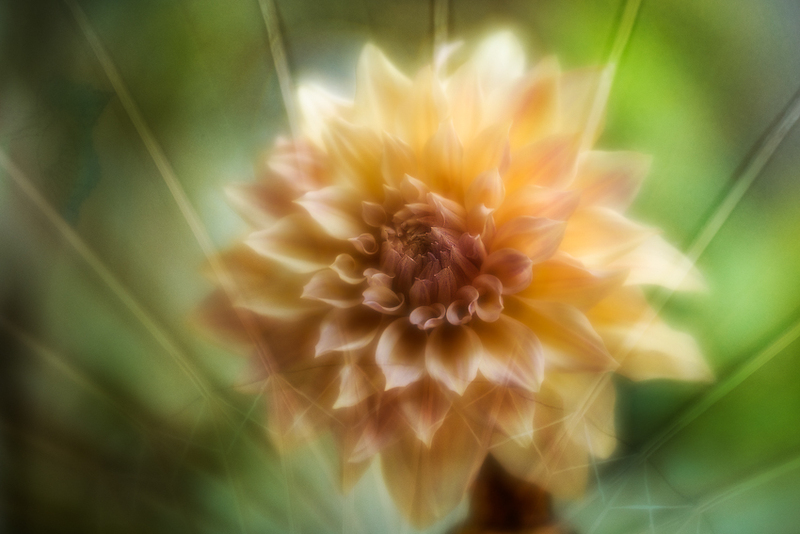 DAHLIA IN BOTTLE WITH ANTIQUE PAPER UMBRELLA – This image was created using the Lensbaby Velvet 56 lens and blending two images – one of the dahlia, the other an antique paper umbrella. Remember, we all begin our photographic journey with little knowledge of the technical aspects of the craft. What we bring first is a good portion of life experience and a sense of wonder that is in a continual state of evolution. Much of what took my breath away in the beginning of this journey still does – sometimes in the same way and for the same reasons, but not always. Life and learning and people and places along the way have expanded my vision and inspiration, and it always will. So, pick a number … any number. Add your own constraints for this exercise so that your focus will be limited and purpose-driven. Challenge yourself to do something (ie., same subject) differently, to veer from your usual approach and comfortable style of shooting. See what you see, what you learn and what you feel. Be open and inspired. 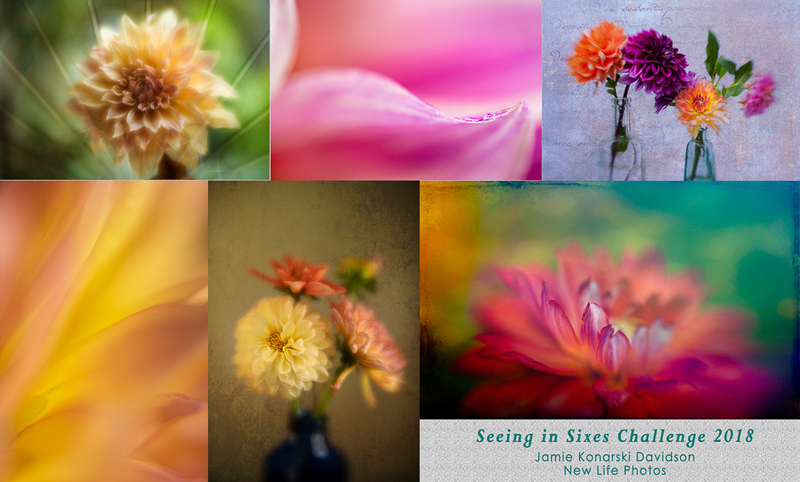 DAHLIAS IN SIXES – And here are those six images that fall within the boundaries of a timeframe, a subject and that each reflect a part of me and how I see and feel about the dahlias.